Share - Experience - Donate with Bottomless Closet! FREE make-up application and consultation for our supporters who spend $100 or more!See Insiders News Below for an update about an exciting event! We keep only the very best of gently used clothing- both designer and professional.Brand new designer shoes between 30 and 50 dollars! Every $100 you spend will help us provide 9 full outfits for aclient over a period of 6 months. Take pride in Shopping at Bottomless Closet!Recycle, Renew, Rejoice! FREE make-overs for our shoppers and supporters who spend over $100!! HELP BOTTOMLESS CLOSET SERVE THE GREAT WOMEN OF CHICAGO! PASS THIS MESSAGE ON TO GROUPS AND FRIENDS WHO WOULD BE INTERESTED IN SUPPORTING US THROUGH OUR SUPER SALES. INSIDER NEWS! IMPORTANT! Mark your calendars for October 28th! Tickets $60 in advance. $75 at the door. Tickets for insiders available now. Call 312.527.9664 - ask for Jude. PLEASE CONSIDER MAKING A TAX DEDUCTIBLE FINANCIAL DONATION TO SUPPORT OUR GREAT MISSION.89% OF EVERY DOLLAR YOU GIVE GOES TOWARDS PROGRAMS AND SERVICES FOR OUR CLIENTS. qcollier@bottomlesscloset.org if you think you can help. 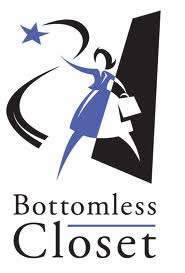 Bottomless Closet is a 501 (c) 3 tax-exempt organization and has the distinction of being the first workforce agency of its kind in the United States.